Wild in the Sage unveiled by Deb Lee Carson. Basecamp for the wild horse lovers in Medora, the Western Edge Bookstore. 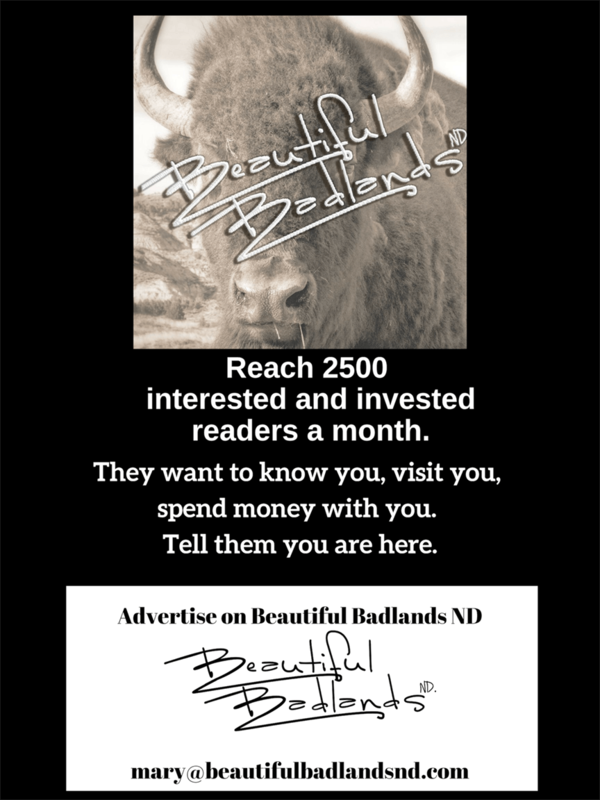 Owner Doug Ellison is a featured writer for Beautiful Badlands. A low-key, friendly group kept the sound of the house humming. Hosts Doug and Mary Ellison buzzed about greeting newcomers, serving up coffee and bottles of water. The dozen or so people from Minnesota, North Dakota and Montana introduced themselves to one another, chatted a bit about their background: ranching, farming, photography, real estate. However, that was not why they were gathered. They were excited to get out into the nearby South Unit of the Theodore Roosevelt National Park. The entrance was just a few blocks away, on the other side of the small town Medora. The group headed out to the park in a half-dozen pickups and utility vehicles. “It’s going to be windy out there on Buck Hill, so be prepared,” she said. Their mission: memorialize a familiar and never-forgotten resident: Blaze, a 15-year-old wild stallion, one of the wild horses at the National Park. He died one year earlier on about March 19, 2017. Though Blaze was the star attraction of the Saturday afternoon event, the lead character was Deb Lee Carson, an internationally famous photographer and chronicler of America’s Wild Horses – a lover of Blaze. There is no more passionate lover of horses than Deb. Though someone may choose to dispute that characterization, it would be a challenge to find anyone who has worked for more than three decades with colleges and universities, national animal groups, biologists, parks, and ranchers to study and promote horses – especially America’s wild horses. Click here to get bowled over by Deb Lee Carson’s body of work. On this cold, slightly damp March weekend, the caravan straggled through the entry to the park. It was not long before they bunched up again to photograph a couple of spry bison scampering across the hills. Headed to the top of Buck Hill. Then, it was off to Buck Hill, one of the key landmarks where Deb and Blaze carried on their relationship. The group climbed the hill, Doug Ellison carrying a special photographic print to be unveiled. The group gathered at the top of the hill, discussing their encounters with bands of wild horses in the Park. The focus of the moment, though, was Blaze. What is your experience with the wild horses? Find out why Blaze is key to the wild horse lovers of the Theodore Roosevelt National Park. Find out more about North Dakota’s Badlands horses here. Stay tuned for Part 2, “My spirit horse” coming next week. Add your email address in the upper right of this page to get a notice when Part 2 is ready to read. The wild horses, or feral horses who call the South Unit home, are a favorite attraction of visitors.